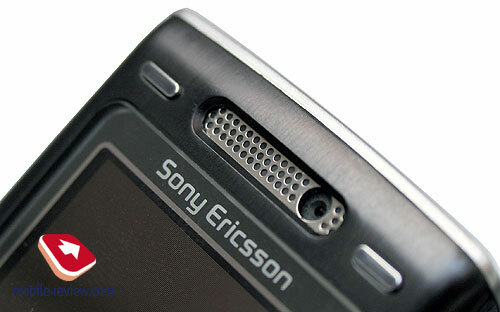 Compact device size was always Sony Ericsson’s the ace in pack of cards, the manufacturer was not trying to present a device that would fit all latest achievements in one case, which would become unacceptably big in size. 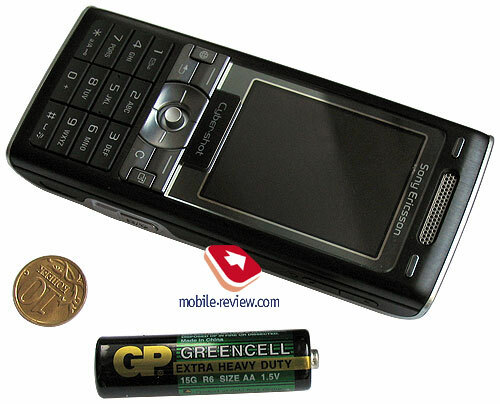 In case with Sony Ericsson K790/K800 manufacturer slightly steps away from this rule – the phones size is 106x47x18 mm. 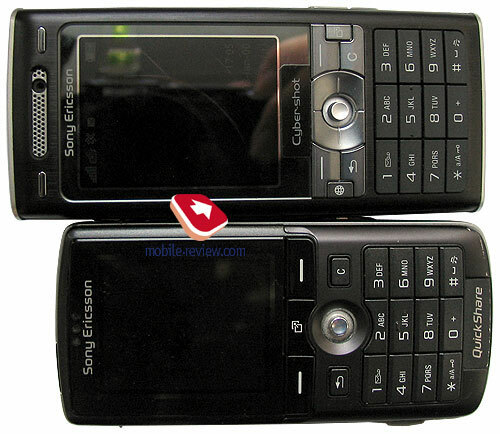 For comparison Sony Ericsson K750i’s size was 100x46x20.5 mm. Almost half centimeter addition in height is not very reasonable for announced models, there is space for placing all elements, their compact positioning. The explanation is different, these phones will become the basis for long-term platform, just like the one that was used from year to year in previous model generations, it gave congruent sizes. First phones based on this platform will not have maximal feature pack, but in future this will be improved. The case’s size allows installing screens with non-standard diagonals for intermediate solutions before VGA, and standard screens with VGA resolution. But this is not the case of upcoming months, life term for the new platform will be around 3-4 years at minimum estate, it will allow the company to activate development of various phones in terms of design in average and higher segments. After common size of K750i I had quite unusual impressions from K800i, it did not fit the standard holster, slightly bigger size was required. At the same time the phone was very comfortable when it was in my hands, it fit my palm perfectly. No discomfort was noticed when the phone was carried in pockets, the phone’s size is normal. Additional 6mm in height don’t matter that much, especially since K750i’s size isn’t big. Another unusual impression was the look of the phone when it was lying on the table, the lens cover on the back side is displaced upwards, as a result the phone falls on the table at certain angle. As if it is inclined towards you when it is lying on smooth surface. Minimal bend angle allows saving your efforts on bending your head in order to see who’s calling you at the moment, kind of minor part, but it’s very pleasant. Color solution is dark-blue plastic, reminds of velvet by touch, as well as soft touch, it’s better to say its lite version. 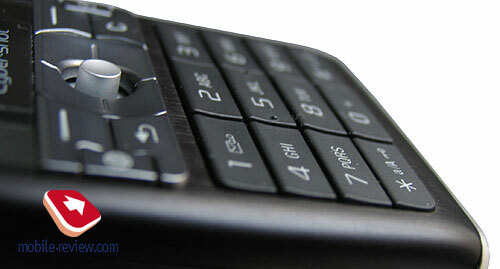 The phone is very pleasing in tactile sense, type of plastic should define its quality. 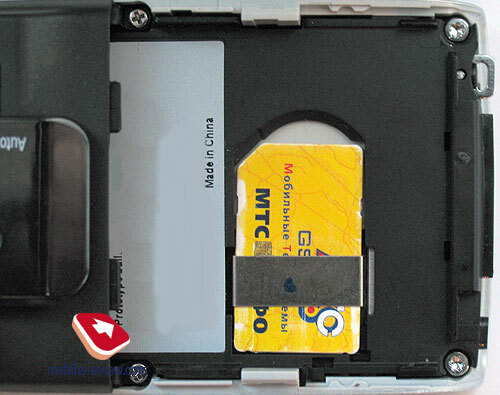 Front panel is made just like in case with K750i out of small metal frame, it protects the phone from falling down. In case you take a close look you will notice metal elaboration-styled appearance, these are horizontal lines. They look interesting and create variety of outlook. This is sort of subconscious element that should convince the user that the case is reliable. 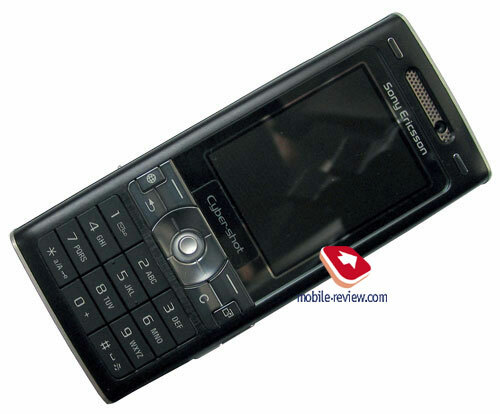 By the way it does not have any obvious or supposed problems, but in case you press hard on the case you might hear squeaking, same story goes for Sony Ericsson K750i. Build quality of these models is identical and in case you did not notice any problems in previous models, you should not find any in this models either. In case you get irritated by squeaking, this phone is not suitable for you. Don’t waste your nerves and go ahead buy something all-metal structured, it seems that plastic is not suitable for you on the whole. 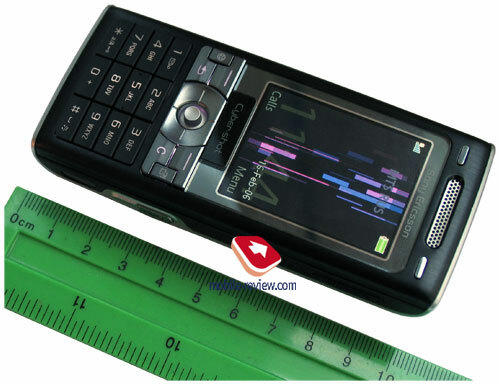 The phone’s weight is 115 grams, which is caused by usage of case reinforcing construction elements, as well as shutters. The manufacturer will follow the tradition of releasing different color solutions, for example we might expect release of white versions. They look stylish, but the problem is that usually only one color is sold massively (except for operators models). Metallic phone’s outlook is supposed to be elegant, not flaring, but recognizable. 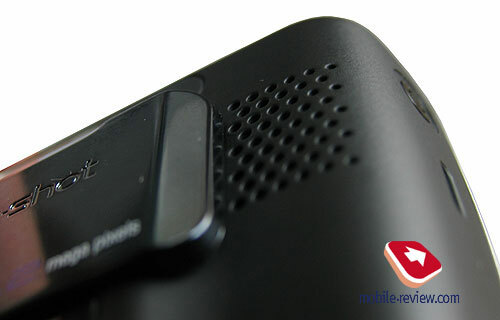 That’s why we see metallic bar of main speaker, in case with K800, CIF camera is located inside it as well, it is used for video calls in 3G networks, there is no other use for it. You can see two tiny rectangles which are buttons in reality, they are used not only for decorating purposes. 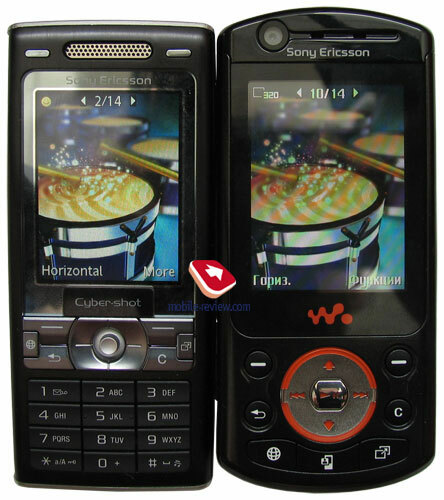 The idea came from Sony Ericsson W600/W550. The buttons were called A-B in first stage, and were active only in games, when the picture was horizontally-oriented. In case with these models, you can use the buttons in games, but their small size makes it rather hard activity. The main usage of the keys is quick switch between modes in Camera menu. But in reality same ergonomic problems exist, that’s why it’s more convenient to use standard menu, although I admit that some users might find them usable and comfortable. The metal topic is not yet finished, the users added reflecting frame around the screen, it glares outdoors, as well as gathers finger tips pretty fast. 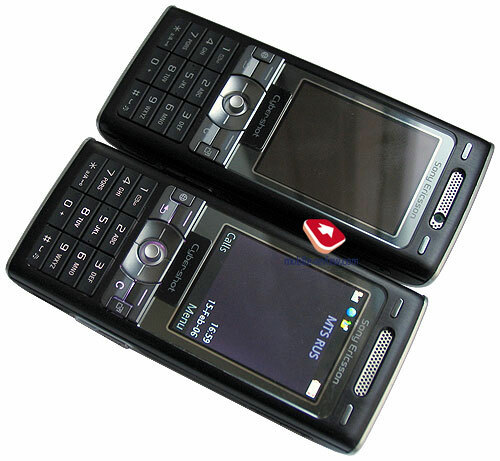 The screen’s marking can be compared to Sony Ericsson K750i. Do you think that appearance of mirror frame is fashion tribute? You’re wrong this time, just like me during first days of usage. Winter is not the best time to find Sun in the sky, the only way to find out what reflecting layer is used for. This model is one of the first with QVGA-resolution made by TFT-technology that provides lossless readability when encountering direct sunlight. Before this moment only phones from Siemens had this feature, but they also have lower screen resolution and paler colors. Experiments with reflecting layer started in model Sony Ericsson W550i, here we see their logical evolution. The other side of the medal is presence of glares at certain angles, as a matter of fact you can see the reflecting layer itself by leaning the screen away from oneself. Viewable angles for this display are similar more to OLED matrix instead of TFT. This means that the angles are around 175 degrees, it is impossible to gain more because the screen is slightly drowned under protective screen and becomes simply invisible. 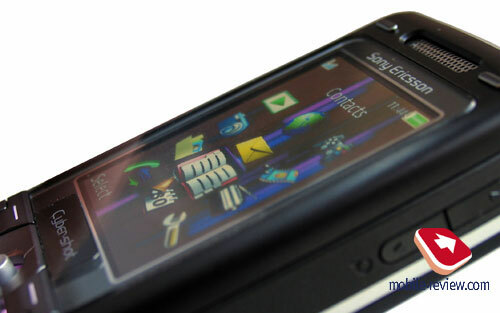 The screen’s quality is good, but does not match the one in Motorola ROKR E2, but can be compared to products from other manufacturers for example Nokia and Samsung. 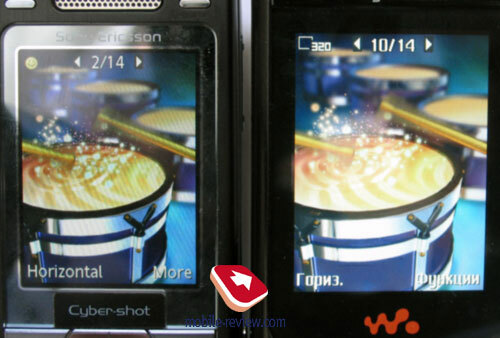 For comparing see photo of K800 and W900i, the new model’s screen offers more saturated color palette, higher sharpness due to smaller diagonal, it’s 2”. The screen can display up to 262000 colors, its resolution is 240x320 pixels. This allows displaying up to 8 text lines on the screen and up to three service lines for most modes, in case Internet browsing, e-mail and messaging more text lines can be used with the help of text font size decrease. A lot of people were worried because the company decided to use D-Pad instead of joysticks. In reality both manipulators will be used in the line-up, but D-Pads abilities are richer than one’s in case with Joystick, this will become essential requirement in future. 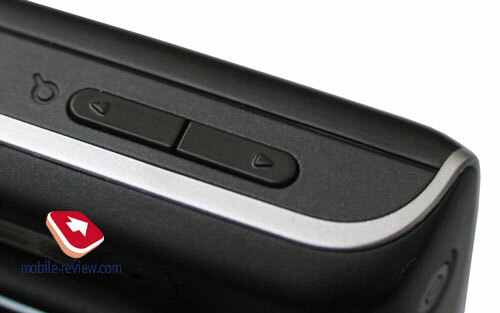 Joystick realization in K800 is slightly different from K750i, now it became more convenient in gaming applications, than it was before, but small navigation through the menu is not that enjoyable and may cause some slight problems. Perhaps it is due to my habit, I don’t know for sure. According to engineers complaints about dust collector which was K750’s joystick’s second name were taken into consideration, and dust protection was improved in new models, this increases mechanical reliability. We will only be able to see if its true or no in December, when we will collect service statistics. 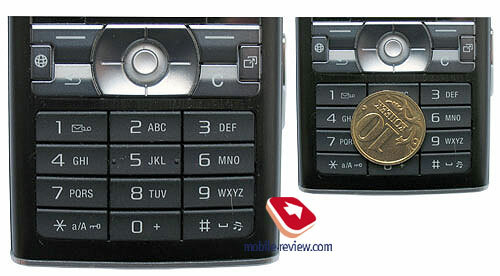 Keypad has no major difference from the one in K750i, the buttons are presented in the same way at first glance, but the plastic is different, it is rougher, to match the case. This was a pleasant moment, meanwhile the unpleasant was the fact that keyboard’s ergonomics suffered a little, 1 and 9 keys are not that convenient to work with especially when you are in a fast typing mood. I don’t know where exactly I got this impression from, but other users are saying the same thing, perhaps the phone balance was changed and this way it affects the overall keyboard’s perception? Keyboard backlight is violet, it is very unusual and pleasant at the same time. Keyboard’s symbols are clearly visible in various conditions. Standard Fast Port interface connector is located in the bottom, USB-cable as well as headset cable can be connected to it. Hole for strap is located nearby. 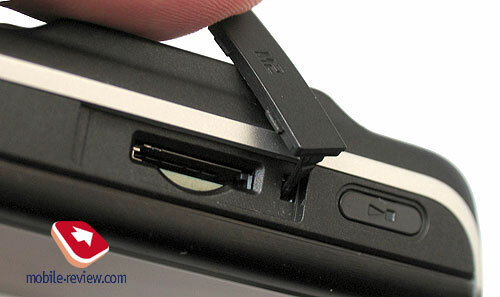 Traditionally for the phone’s top we can see Power button, it is used for activating profiles in stand by mode. 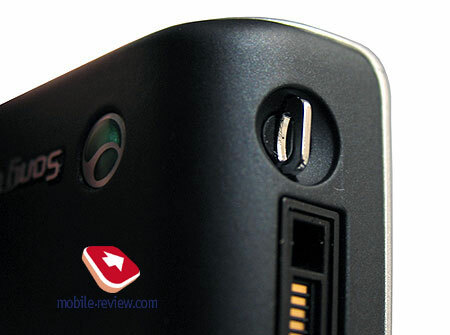 IrDA port is located on the right side, near the joined volume control and camera buttons. 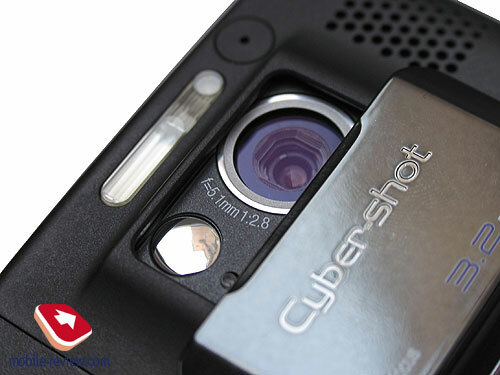 The placement of elements in one side is explained by camera’s horizontal working mode, it became common for most phones manufactured under this brand. 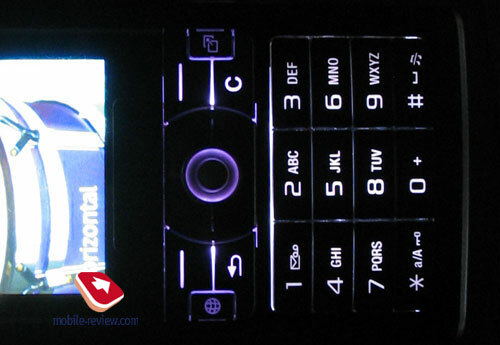 Music button is located on the left side, it can activate either radio or music player, or the last used application. 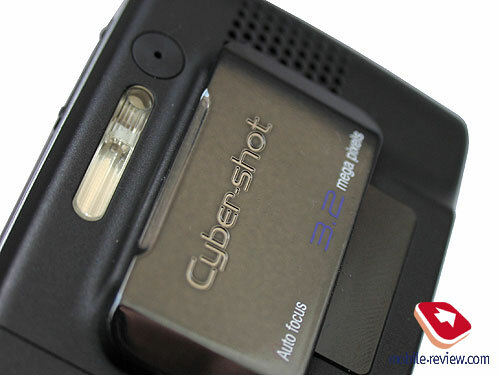 Memory card slot is located slightly lower, this time we have MemoryStick M2, these are miniature cards that are similar to microSD in terms of size. The miniaturization path is used by all manufacturers and sometimes it brings its own style in mobile phone’s work. 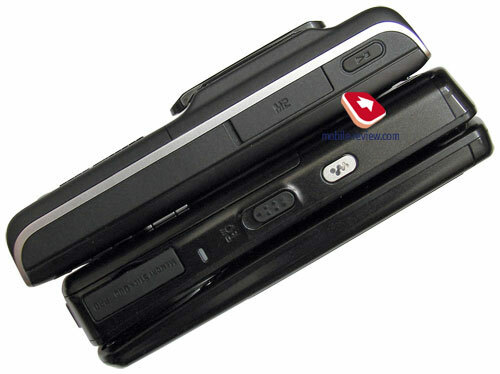 As for this model the slot for memory card cutoff point is attached to the case with the help of short leash, it can be easily lean back once you hock it with your nail, but the process is far from being described as comfortable. The fact that the card’s size is small makes it harder to eject from the phone. Usage of at hand objects is welcomed. In case you don’t switch memory cards quite often it’s okay, you will not draw much attention to this fact, but in all remaining cases or an attempt to swap the memory card in public transport you might end up losing the card. Miniature is not always useful. 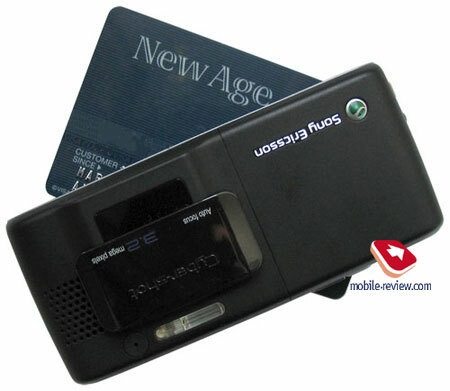 Adapter for using the card in card reader or laptop is among the package contents. At the moment widespread of this cards is minimal, but the company promises to release 512mb capacity memory cards by March and in June maximal capacity card for 2006, which is 1gb, will be released. In future we will see the capacity expansion, but not that fast, the smaller card size is, the more expensive bigger capacity will cost. 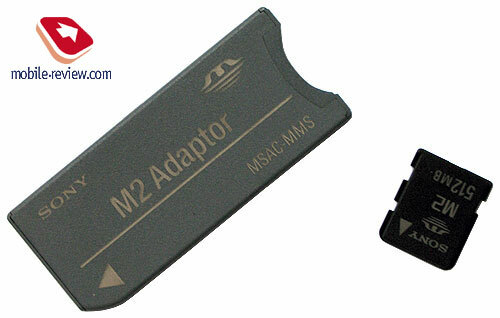 At the moment people say that the price of M2 will not overcome the price of analogue in terms of capacity MS Duo Pro cards today. Basically this is logical decision, since the memory cards can become major limitation for spreading new products and manufacturer should use wise price policy in order to promote it. For future owners of K790/K800 or should I say whole new line-up owners maximal capacity of 1gb can become a serious limitation of their music tastes, a lot of people nowadays prefer having 2gb of space or even more. 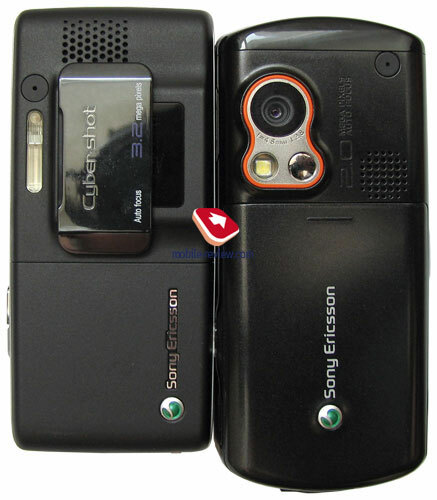 While seeing many manufacturers going in for microSD (Motorola and Nokia for example), we can say that these phones will have parity over products from Sony Ericsson. 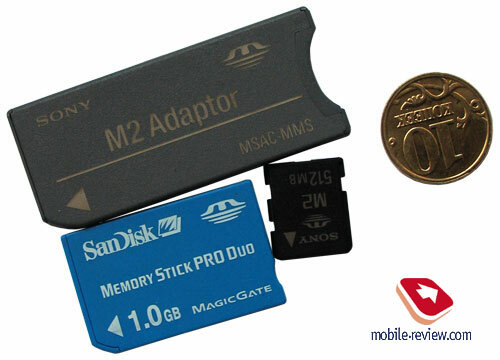 But as first representatives of phones with M2 cards they will certainly feel lack of memory cards assortment for certain markets. Packing the phone with 64mb memory card is enough for minimal interaction with the phone (couple of games, dozen of shots, few ring tones and so on). The camera is located on the back side, it is covered with shutter blind. 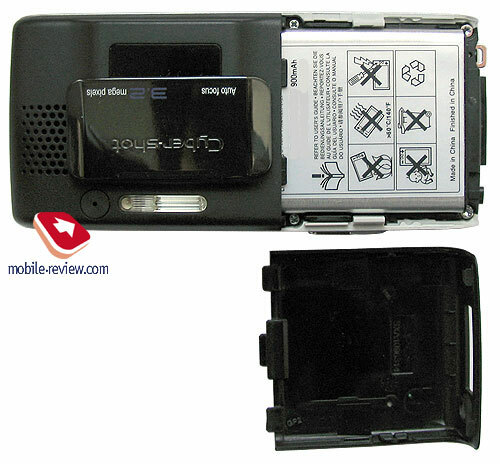 You can see xenon flash and aerial adapter covered with rubber cork nearby. We will not discuss the camera here, there will be a separate material that will follow right after this one. The phone has Li-Polymer battery named BST-33 with 900 mAh capacity, it becomes standard for all recent models including inexpensive ones. 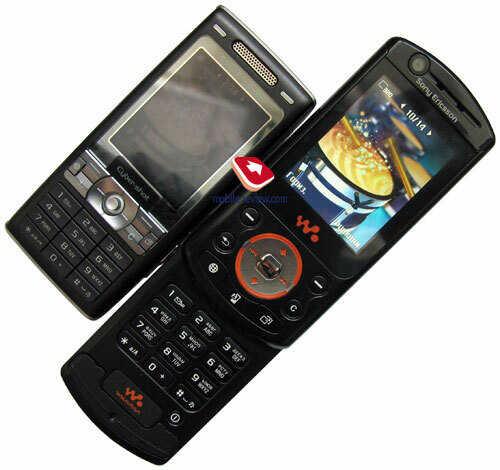 According to the manufacturer the phone can work for up to 350 hours in stand by mode and up to 2.5 hours during phone calls in UMTS network (only for K800), and up to 7.5 hours during phone calls in GSM-network. The usage of new platform, different screen type, increased specifications were supposed to increase phone’s energy consumption. Huge amount of work was done inside the company in this area, as a result the phone acts just like K750i used to act, and in some modes even better. For example power consumption of CMOS-camera model is very low despite its specifications, on the other side usage of flash which is xenon affects negatively on battery’s life. For those who are planning to take a lot of photos, listening to music through wireless headphones and checking e-mails every two hours as well as having their ICQ client minimized and in addition to all what I mentioned above, play some games should be ready to charge their phone once a day. It takes almost to hours to charge the phone up completely. A the same time common usage of the phone with 1 hour spent for phone calls 10-12 sms per day and periodic e-mail checking, etc leads to approximate two stable days of battery life (in Moscow). For European networks that have tighter coat of network base stations this time will be increased. You can see the date and time as well as battery level percent by pressing side key in stand by mode. 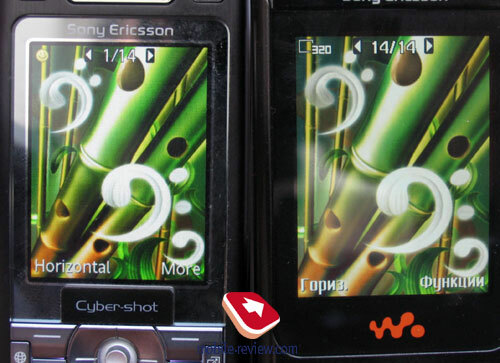 This is an original feature used only in Sony Ericsson phones, it is adaptive, the numbers might change according to what your actions are (after 20 minute phone call the numbers may become critical and restore afterwards). This model lacks 3D accelerator, it is using only standard API, this is the first thing you should know. The synthesizer is 72-tones but it used only for playing midi files, in all other cases you should use mp3 files or any other type, eAAC+ for example. Bluetooth version for this model is 2.0, it supports EDR you can save improved energy saving mode in the menu. A2DP module is supported, this allows using wireless stereo headphones. The module itself (Bluetooth) was reworked, now it has wider capability with 3rd party devices. 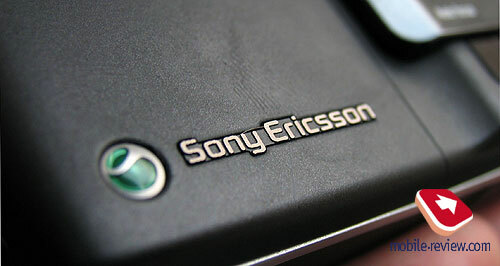 Considering the fact that common realization of this technology by Sony Ericsson is rather good (above average), no major problems should be encountered.